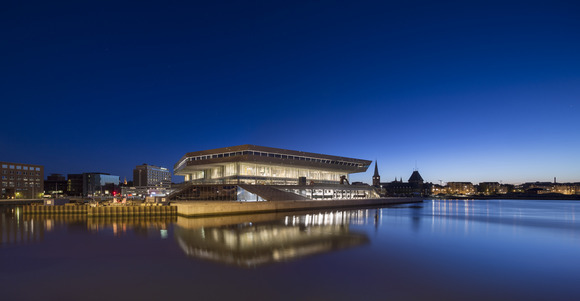 AARHUS, Denmark – The magnificent new Dokk1 Library and Citizens' Services at Aarhus Harbor in Denmark is the largest public library in Scandinavia. HARMAN distributor, LydRommet, teamed up with A/V system integrators, Solutors, to bid successfully for the technical AV contract. Situated on the waterfront, and forming part of the larger Urban Mediaspace Aarhus project, it has been jointly financed by Aarhus Municipality and Realdania at a cost of $301.9M (2.1B DKK), and is spread over 64,000 square feet (60,000 square meters) of floor space. From the beginning was essential to create a multi-purpose library with each room being multi-functional. LydRommet and Solutors’ technical designers, they were able to meet the audio requirements set out by consultant Anders Gade, from Gade Mortensen Akustik, by offering an integrated HARMAN solution. “We offered Solutors design support and suggestions on how to create a complete solution based on HARMAN products, making sure that the required functionality was met with the specified products,” said LydRommet CEO, Flemming Bjerke. “We are delighted with the Dokk1 installation, as this is an extremely complex solution with a super simple user interface. LydRommet’s Henrik Foldager and Karsten Ørkild oversaw the complex audio design, which is based on networked BSS Soundweb DSP and Crown DCi|N amplifiers, running on BLU link from Soundweb. The 54 amplifier channels and high number of individually powered JBL speakers are essential to maintaining the required versatility. Two rooms have been equipped the main hall, which can be divided into two separate rooms, and a second smaller Kids Room. The main hall’s acoustic walls have several technical functions: concealed behind the perforated wall panels are acoustical curtains that can change the room acoustics, enhancing the reverberation; at the same time the wall speakers also provide the cinema surround sound and are individually powered. The room parameters can be changed between classical and jazz concerts and for presentations. “An essential pre-requisite had been that the equipment should be simple to use, obviating the need for a technician to be on site during concerts or meetings,” stated Jannik Mulvad, technical spokesman for DOKK1. In presenter mode the active AKG DMS800 wireless mics are sent to the distributed speech enhancement system in the ceiling. This is based on 18 individually powered JBL Control 28s while the program sound is delivered from a PC to the JBL VRX928LA system, in stereo. In cinema mode, a separate L/C/R system, using eight JBL AM5212s plus four subs from the VRX918S live PA system, comes into play. Surround sound speakers, concealed behind the perforated wall panels as well as 18 individually powered JBL Control 25 AVs, support this mode. In live sound mode the JBL VRX928 / VRX918S subs, along with a delay system set half way down the hall, is activated. The delay system is on a separate program feed for the latter half of the hall when the foldable wall divides the room into two. In acoustical mode all sidewall and ceiling speakers are individually amplified and these speakers discreetly provide the room’s reverb sound. There are eight AKG C480/CK61 mics at the stage area, which pick up the sound and 36 C25AV and C28 JBL speakers to reproduce the required reverberation. Given the complexity of the installation, a combination of Dante, BLU link and MADI platforms are all used for the audio signal transport, with BSS BLU-806 processors forming the heart of the system. Connected to this on a Dante platform are AKG DMS800 wireless microphone systems, while a Soundcraft Si Performer 2 with Compact Stagebox, is linked via MADI, although the console itself is connected to the Soundweb on HARMAN’s proprietary BLU link. A second Performer 2 can be found in the Kids Room.